Before explaining why they’re so beneficial, let’s make sure you know what they are. 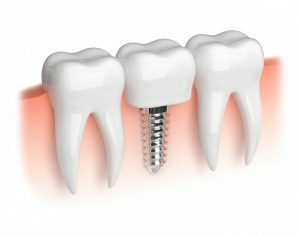 Dental implants are a one of a kind replacement method that has become one of the most popular restoration options for patients today. Think of the implant itself as an artificial root for your tooth. A metal post is placed in your jawbone and it actually bonds with your natural bone. This makes a super stable base for supporting your restoration (artificial tooth). Prior to losing your tooth or teeth, biting and chewing gave your jawbone the stimulation it needs to remain healthy and strong. Even missing a single tooth can lead to jawbone deterioration, which can cause further tooth loss, and a more aged looking face. The longer you wait to replace a missing tooth, the more likely it is to see deterioration in the jaw. Dental implants are the only restoration option that preserves natural bone by giving your jawbone the stimulation it needs. Most implants are made of titanium, which is biocompatible. This gives your implant the ability to naturally bond with your jaw bone. Besides its amazing bone stimulation, implants also feel, look, and function just like your natural teeth. Because the implant is incredibly stable, you can eat most foods without worry. Additionally, you can talk, chew, and laugh as hard as you want! Your implants will never slip or come loose. Last but not least, the restoration your dentist will create to mount on your implant will look just like your natural teeth. These artificial teeth will be made out of dental porcelain, which is an extremely durable material that mimics your tooth’s shape, size, color, and even feel. It also reflects light the same way as your natural teeth, so you’ll be the only one that knows you have them! The implant itself can last for a life time if taken care of properly through routine brushing and flossing and regular dental visits. The restoration for your implant will need to be replaced after 10-15 years, depending on how well you take care of it. This is the longest-lasting replacement option on the market, which is one of the main reasons it’s become so popular. Does it sound like you could benefit from dental implants? Contact your dentist in Harrisburg to discuss if this stable, long-term restoration is right for you. Dr. Gary M. Klein currently practices at Klein Family Dentistry, where he takes pride in offering placement and restoration of dental implants all under one roof. He believes implants are the best way to replace missing teeth because of the health benefits they bring and their longevity. For any questions, he can be contacted through his website or by phone at (717) 652-6644.